toad crept in through a broken pane in the window. She was very ugly, clumsy, and clammy; she hopped on to the table where Thumbelina lay asleep under the red rose-leaf.
' This would make a beautiful wife for my son,' said the toad, taking up the walnut-shell, with Thumbelina inside, and hopping with it through the window into the garden. 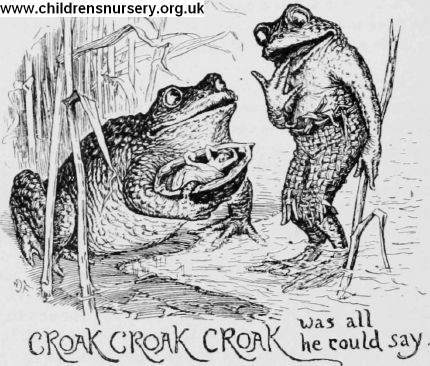 There flowed a great wide stream, with slippery and marshy banks; here the toad lived with her son. Ugh ! how ugly and clammy he was, just like his mother! ' Croak, croak, croak !' was all he could say when he saw the pretty little girl in the walnut-shell. Outside in the brook grew many water-lilies, with broad green leaves, which looked as if they were swimming about on the water. The leaf farthest away was the largest, and to this the old toad swam with Thumbelina in her walnut-shell.